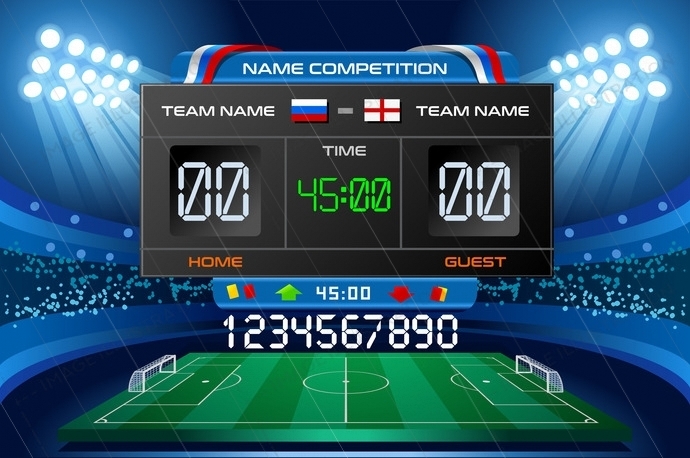 Electronic scoreboard stock images by Aurielaki. wallpaper football illustrations in EPS10 EPS JPG AI. Electronic scoreboard displaying match results. Vector illustration. SKU: Electronic-scoreboard-football-wallpaper-AurielAki. Category: World Cup 2018 Russia Soccer. Tags: banner, basic, betting, black, board, broadcast, championship, competition, countdown, decorative, design, digital, display, electronic, equipment, field, football, game, graphic, ground, illustration, information, layout, league, light, match, minimal, number, online, play, result, score, scoreboard, screen, sign, simple, site, soccer, sport, stadium, table, team, template, time, timer, vector, wallpaper, web.